If you control for developing countries and South Africa, with its history of apartheid and ethnic conflict, there is a strong link between the number of guns per capita and gun-related homicides in a country. 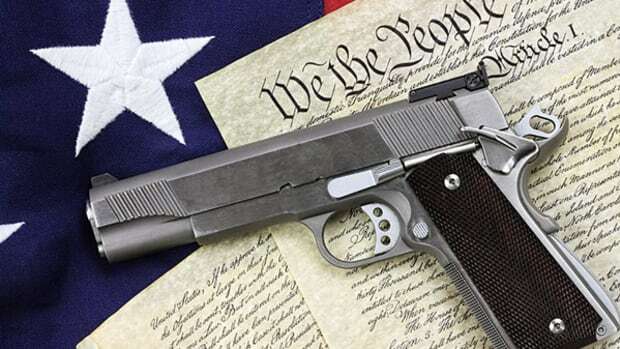 Editor&apos;s Note: Tom Hartsfield has written a follow-up to this post, "Gun Ownership Neither Increases Nor Decreases the Crime Rate." 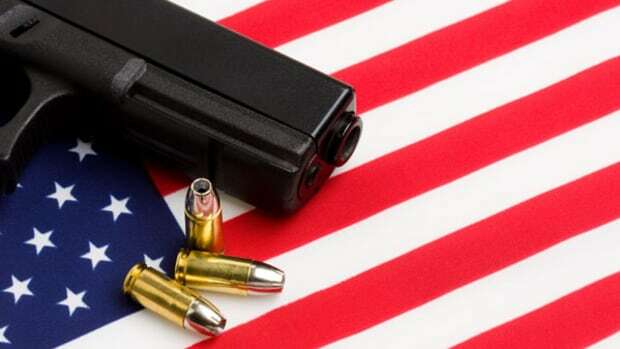 Since the tragedy at Newtown, citizens and lawmakers have been pushing for tighter gun control. Their argument seems rather intuitive: The fewer guns, the safer we are. 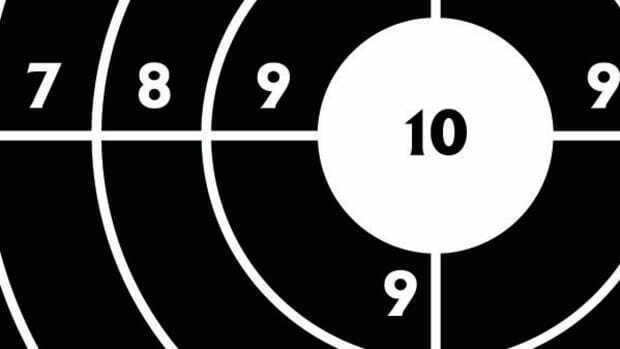 Popular Science hammered the point home in an article titled "Science Confirms the Obvious: Gun Laws Are Associated With Fewer Gun Deaths." But is it really that simple? 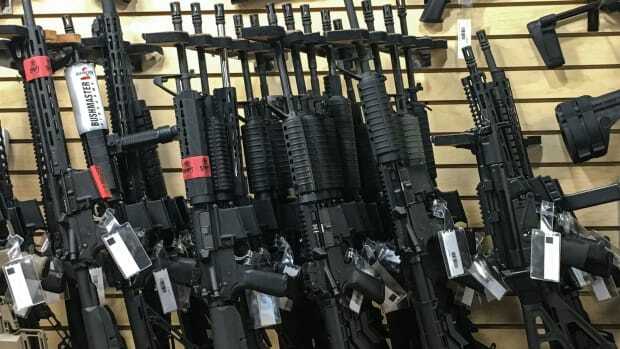 According to the article, the authors "created &apos;legislative strength scores&apos; on a scale of 0 to 28 for each state&apos;s firearm laws, with each law counting as one point." That seems rather arbitrary. Simply counting the number of laws on the books doesn&apos;t take into account how tough or effective the laws are. The question, "Do gun laws reduce gun deaths?" is too vague of a question to answer quantitatively. Instead, we should ask, "Are more guns linked to a higher homicide rate?" That&apos;s a specific question we can answer quantitatively. Unfortunately, while we do have data on the homicide by firearm rate for most U.S. states, we don&apos;t have reliable information on the number of guns in each state. 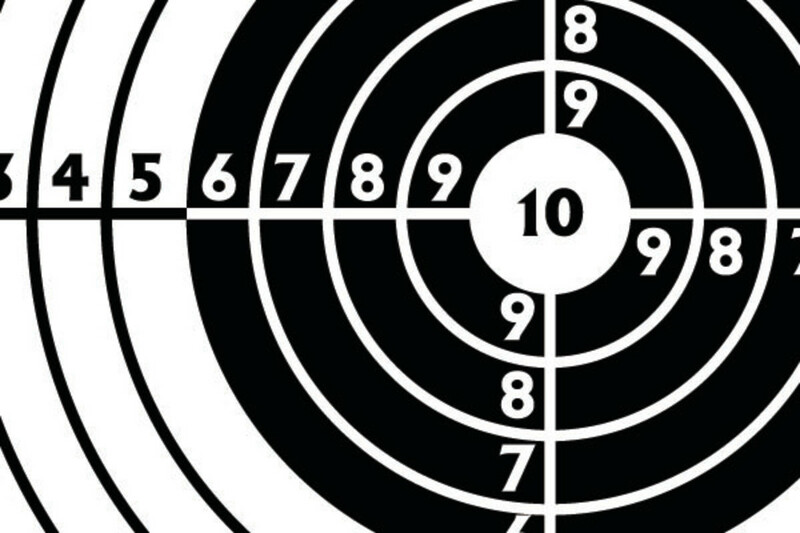 (The best data we have is background check data, and that isn&apos;t consistent across the country.) Time for plan B. 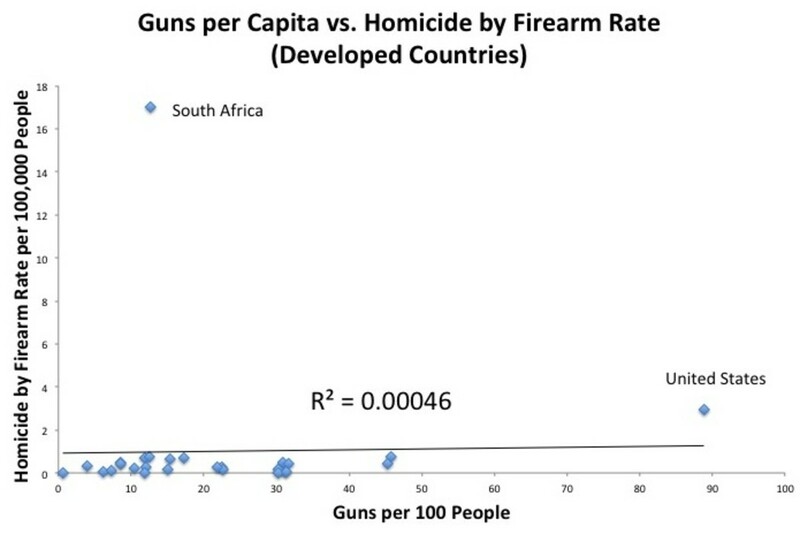 As shown, when considered from a global perspective, there is no correlation between the number of guns per capita in a country and the number of firearm-related homicides. Note that the United States has, by far, the most number of guns per capita, at 89 per 100, but a homicide by firearm rate of only three per 100,000. 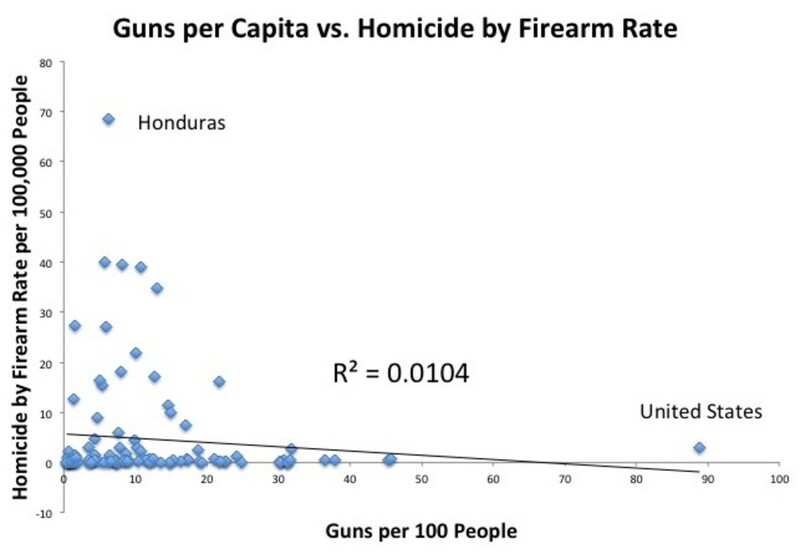 Compare that to Honduras, which has only 6.2 guns per 100 people but a sky-high homicide by firearm rate of 68 per 100,000. Again, no correlation. But, notice the outlier, South Africa. That is a country with a history of apartheid, ethnic conflict, and violence. It is obviously skewing the results. So, what happens if we eliminate South Africa from the analysis? Now, a clear correlation exists. When the numbers are crunched, they are highly statistically significant (p < 0.0001). 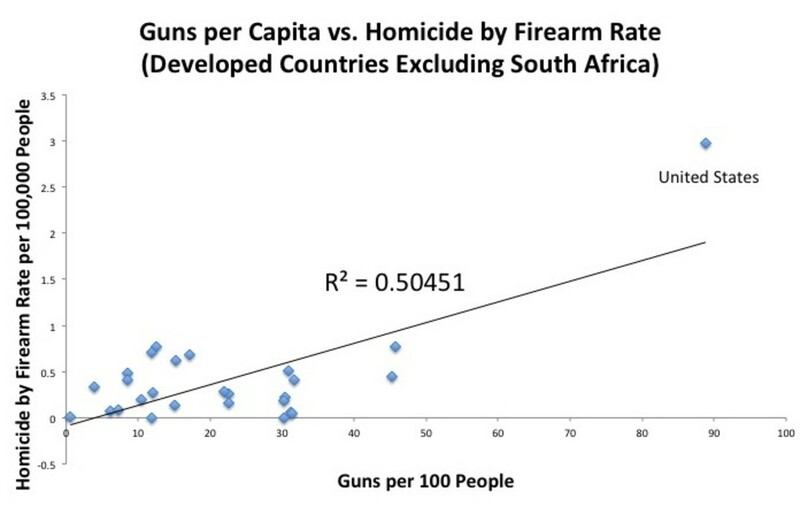 Thus, when we consider countries that are similar to the United States, a strong correlation exists between the number of guns per capita and the gun-related homicide rate. Perhaps the U.S. should consider modeling its gun laws after some of the other developed nations. n.b. : The developed countries in the third graph included: Australia, Austria, Belgium, Canada, Denmark, Finland, France, Germany, Greece, Iceland, Ireland, Israel, Italy, Japan, Luxembourg, Malta, Netherlands, New Zealand, Norway, Portugal, Spain, Sweden, Switzerland, Turkey, the U.K. (represented separately as England & Wales and Northern Ireland), and the United States. Excluded from this list were South Africa, for the reasons listed above, and Andorra, Bermuda, Faroe Islands, Vatican, Liechtenstein, Monaco, and San Marino due to insufficient data. This post originally appeared onRealClearScience, a Pacific Standard partner site. You are no less likely to be a victim of violent crime in a country with fewer guns. 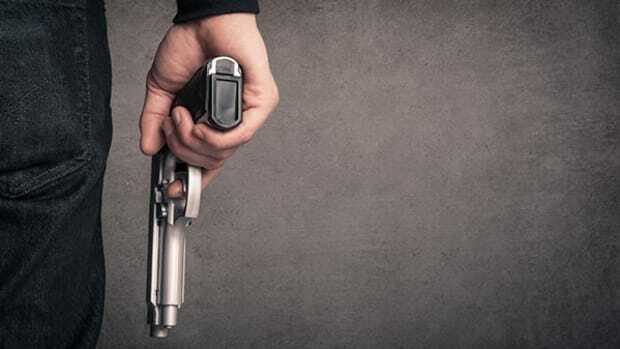 We can continue to argue about gun ownership and its relationship to violence, but studies have confirmed at least a few peculiar aspects of firearms. We need to stop spinning the research on mass shootings and acts of terror—the outliers—so that we can focus on more common and deadlier threats. New research finds several state-level statutes are linked to homicide rates, including universal background checks. Researchers report white Americans who hold implicitly anti-black attitudes are more likely to have a gun in the house, and to oppose gun-control measures. Violent Crime Is Dropping: Why Are We So Scared? 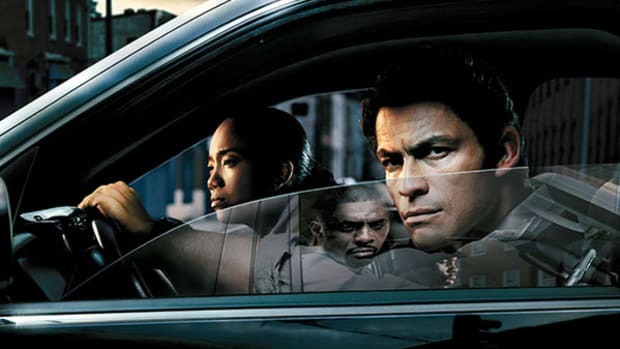 A majority of Americans continue to overestimate crime rates, even as crime levels drop across the country.